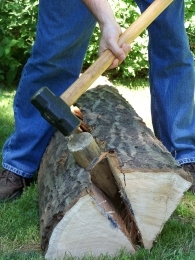 The red oak log yielded to the iron wedges and wooden gluts, splitting along its length. The straight grain and natural beauty of the wood exposed to the light for the first time. I knew in that moment, that the log would provide the wood for some handsome looking chairs. Making traditional chairs with hand tools is satisfying work. You split your material straight from a log, shape the wood with a few simple tools, join it together, and weave a seat. Each handcrafted chair reveals something of the maker, and the nature of the wood from which it is made.